The Minions, the self-explanatory henchmen of the “despicable” villain Gru, were the breakout stars of the Despicable Me movies. With their fun character designs (simple enough for a kid to draw, but flexible enough to give them variety), gibberish speech and cartoonish antics, it’s not hard to see why the Minions have won audiences over. It was only inevitable that they’d end up with their own movie. The only question is how well could these show-stealing sidekicks carry a movie on their own? That’s a question that, in a lot of ways, still has yet to be answered. 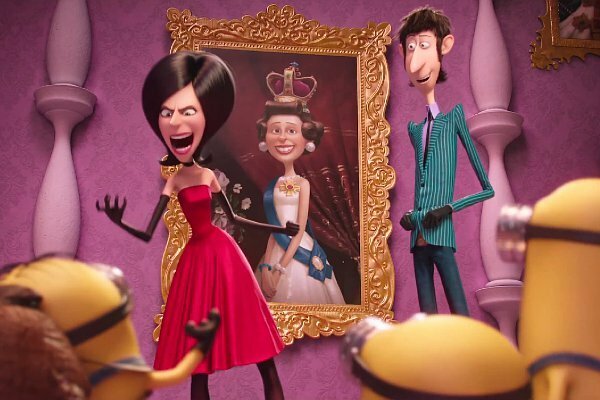 The Minions may get the title role this time around, but they end up sharing much of their screen time with various human characters, with latter parts of the movie in particular focusing on the super villain Scarlet Overkill (Sandra Bullock). The story serves as both a prequel to the Despicable Me series and an origin story for the Minions. It turns out the Minions are as old as life on Earth, and their only natural instinct is to serve the baddest boss they can find. Through many millennia, they’ve served the likes of a T-Rex, a caveman, the pharaohs of Egypt, Count Dracula, and even Napoleon. But the Minions aren’t always good at their job, and have caused the accidental demise of these past masters, leaving them to search for a new master for extended periods of time whenever they bump off an old one. Fearing they simply aren’t good enough to serve a master, the Minions isolate themselves in Antarctica. But without a master to serve, the Minions have no purpose and fall into depression. In order to save his fellow Minions, a tall Minion by the name of Kevin decides to search the world for the baddest boss he can find. He is accompanied by the short Minion named Bob and the cycloptic Minion named Stuart in a quest that ultimately takes them to 1960s New York, Florida and England. That serves as the setup for Minions, and it is arguably the most consistent portion of the film, as its segmented nature works wonderfully for the Minions’ comedy. The rest of the movie has its share of humor, but in trying to make a bigger plot, it often feels like it doesn’t know what to do with itself. The Minions themselves remain a highlight, as their often-bizarre mannerisms and speech have yet to wear thin. Kevin, Stuart and Bob keep the comedy strong even in the movie’s weaker moments. So while ‘Minions’ may stumble in regards to storytelling, the lighthearted nature of the titular characters themselves should keep audiences entertained, with plenty of jokes aimed at both children and the adult crowd. The problem with this Minions spinoff is that it often feels like the filmmakers didn’t quite have full faith in the Minions to carry their own movie, so more human characters are added in an attempt to keep the story tighter. Unfortunately, the people they end up interacting with aren’t particularly memorable. This is especially the case with Scarlet Overkill, who seemingly steals the spotlight from the Minions during the film’s second half. Though Sandra Bullock’s voice work is well done, the character herself is neither funny or memorable enough to justify the movie’s shift of focus to her. The character at first shows promise (she flies into a villain convention via rocket-propelled dress) but she ultimately lacks any standout character features other than her presentation. When the movie works it’s a lot of laughs, but the story ends up feeling too thin for for its own good, with too many scenes feeling like padding. 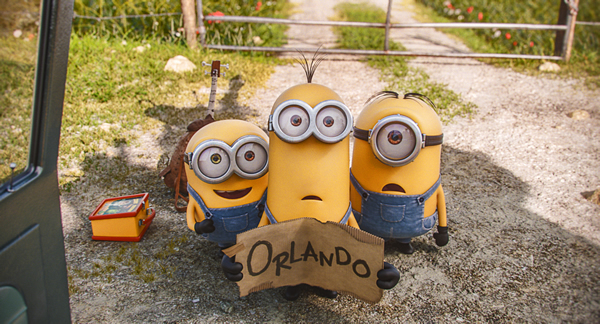 Some fans of the overall franchise may not be too upset by Minions’ relatively shallow storytelling. After all, the Despicable Me movies are far from animated masterpieces, emphasizing cartoonish silliness over deeper storytelling. But the Despicable Me movies at least employed a bit of heart into the mix. They may not have been thematically rich, but they added some sentiment to go with the gags, and that isn’t found here. Some might say that the nonsensical nature of the Minions might not lend itself to anything more than slapstick. If this movie were strictly focused on the Minions that may be a good point, but with so much attention given to the human characters, you kind of wish that the filmmakers would have continued what they did with the Despicable Me films, instead of minimizing the characters’ personalities to simple punchlines. If I sound largely negative, I apologize. 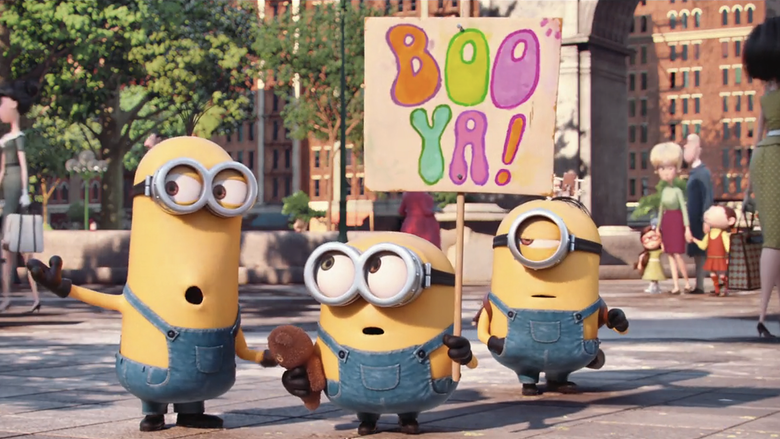 Minions is a fun movie with a lot of humor, and its titular characters still have some charm. But it isn’t quite the Minion-centric extravaganza we may have hoped for, nor is it quite on equal footing with its Despicable Me predecessors. It does, however, provide enough Minion-y goodness to make for some decent entertainment, particularly for younger audiences. At the very least, it’s a nice appetizer for Despicable Me 3. Previous Previous post: Is Ocarina of Time Holding the Zelda Series Back?